Bay Associates/NEI Systems flexible mechanical assemblies allow you to obtain the sharpest possible images. You have a clear vision of how you want your new medical imaging equipment to perform. You don't want to see any fuzzy pictures. Electronic noise doesn't cut it either. Dangling from a high wire just before product launch is not your idea of a thrilling time. You're looking for an innovative, quality-conscious supplier that will work with you to design and develop the complex video cable assembly that you need for a smooth "feet on the ground" product launch. That's where the NEI Systems' team comes in. Engineers and manufacturers choose Bay Associates Wire Technologies/NEI Systems for its clarity of vision and precision workmanship. Through collaboration and brainstorming, NEI Systems focuses the collective power of years of cable interconnect design and innovation to help move your project launch forward quickly and then support it through the product life cycle. 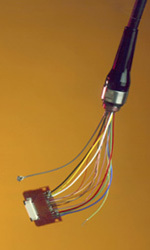 Features of the endoscope video cable assembly include: low-noise, video cable composed of 23 micro-coaxes and discrete PFA-insulated 34 and 36 AWG fine wire, copper conductor; custom-molded boots, machined soaker caps and cable nuts; failure-protected flex circuit assemblies; and epoxy-potted solder joints. Flexible cables are our specialty. At Bay Associates Wire Technologies/NEI Systems we specialize in the manufacture of highly flexible, custom cable assemblies with multi-conductor, composite cables ranging from 12 AWG to 38 AWG. We may incorporate coaxial leads into the custom cable designs. Our design expertise coupled with problem-solving skills, customer interaction, and state-of-the-art equipment lead to robust and reliable cable assembly systems. We use the best brands of high-quality connectors from the top manufacturers, including Tyco/AMP, Molex, Packard, FCI, JST, Hirose, and ITT Cannon, Lemo, and Fischer, incorporating them into our high-quality and functional designs. It's easy to submit your design ideas online for a free quote. Need highly flexible custom cable assemblies? Contact us to receive information on estimated costs to manufacture your components. We design, develop, and manufacture our endoscope video cable assembly and other interconnect products utilizing fully integrated and diverse manufacturing capabilities; while we market our capabilities primarily in the Americas and Europe, we have customers around the globe. Like the user of this endoscope video cable assembly, you are constantly at work to improve your products. Through creative design, the latest interconnect technology, and the focused efforts of a dedicated work force, NEI Systems is positioned to deliver the high-quality custom cable assemblies that you need for your unique medical imaging, radiography, and electro-surgical equipment. You have the power. Give NEI Systems a call.